News Feed. 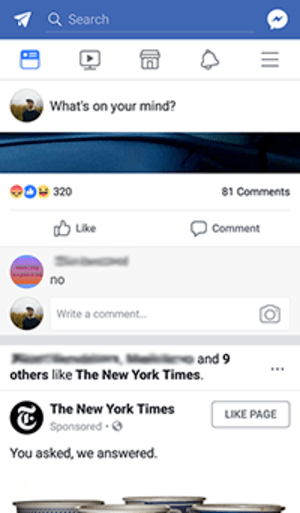 On this feed, you can see different comments, status changes, tags, likes, videos, photos, and links, which are also known as edge’s, made by you and your friends. An Edge is any form of interaction a member of Facebook may incur with the use of an object similar to the primary action of object creation wherein FB contacts would share, like, or comment on. You might be wondering why there are many edges made by you and your friends but why only a few of them are seen in the News Feed? In order for your post to be seen in the page, there are three components you have to remember: affinity, weight, and recency. Each of these components plays an important role in the edge rank algorithm. Therefore, edges seen on your News Feed are not randomly selected. 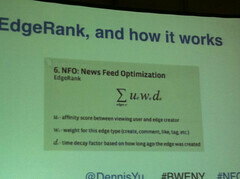 The name of the algorithm used by FB (Facebook) to uncover what is shown in the FB member’s news feeds is called EdgeRank. The newsfeed is the “Killer App” of Facebook. There is a surfeit of significant information available readily to users of FB and the order wherein it is shown is the newsfeed. The Newsfeed is not literally a feed of news, but rather a chart of the best relevant Edges revealed by the EdgeRank Algorithm. EdgeRank finds out among your connections which is frequently appearing and might be the most relevant for you to consider. This can also determine which type of content should rank higher than the rest on your newsfeed. It is therefore significant to understand how this algorithm can prove to be effective. 1) Affinity Score (ue) – is a score between edge creator and the viewing user. The more actions you make to a friend’s account, like sending messages or visiting profiles, the higher the affinity score will be. On the other hand, you do not gain any affinity score from them when you visit or send them a message unless they also view your profile and/or do other activities within your account. What do affinity scores do? Users with high affinity points have greater chances to appear in your News Feed than those who have lower scores. You might notice that whenever you interact with someone on their profile walls, you will realize they are always in your news feed. Whatever interaction you do like commenting on anyone’s photo would be considered a sign that you are close to that particular friend in FB. This is Facebook affinity in action. Just remember the rule – the more frequent a friend appears in your FB newsfeed, the more possibility your affinity is expanded. In turn, it augments the probability of them showing up in your feed. Nevertheless, some people may limit themselves to a small amount of FB connections but it seems to be effective for most FB people as long as there is interaction undertaken and not just by viewing profiles alone. 2) Weight Score (we)– depends on the edge made. The more important the edge is, the higher the possibility of it being seen in the News Feed. Videos, photos, and links are considered the heaviest forms of edge. Apparently, a video post has a greater chance to be seen in the News Feed than a simple “like”. Always remember that friend’s photos are more significant to “like” rather than a business profile. Exert more effort in featuring objects with high scores for Edge weight so that more people will comment and communicate with you even if you do not really understand the preferences of your followers. Some succeed in posting videos or links to acquire any interaction from the contacts. Undoubtedly, variety is crucial but comprehending the weights of various forms of objects will lead you to enhance potential audiences on your wall. 3) Recency Score (de) – is the time when an edge is created. Actually, it is also known as time decay. Recent actions are prioritized than those made a few days earlier. Edge ranking pays more attention to new activities rather than old ones so it is wise to post everyday or every now and then to update your contacts on what is going on. It is a fact that some of your FB friends are not always online 24/7 so there is probability that they might have missed your status update. There is also a chance to lessen the competition for newsfeed spots by increasing the exposure through content creation when others are less likely to post anything. You may notice that some post even while using their mobile phones or other gadgets and the reason behind this is to update their status and apply the time decay perspective. To gain success on Facebook, it is vital for all businesses and digital marketers whether huge or small, to have an extensive knowledge on the ins and outs involved in the execution of EdgeRank and how it affects the Facebook user’s newsfeed.